I was not planning to write about the situation in Baltimore, but I’m afraid the reality the citizens of this US city live is more global that they intended to make it. Actually it was a personal athlete idol, Kareem Abdul Jabbar, who has said it the best way when he was talking about another similar situation, in Ferguson: “it is not just about systemic racism — it's about class warfare and how America's poor are held back.” Now just replace America with any other country’s name you want. What’s going on this minute in Baltimore - even though it has strong race elements - is not about racism, is about the poor and an establishment that literally works for the interests of the rich. Racism nowadays has little to do with colour or ethnicity but with money. An establishment that acts with raw violence in any chance always targeting the poor doesn’t matter their colour or ethnicity. It is not just a police and the security forces who act motivated of prejudices that wants the good guys to wear suits but it is the whole state mechanism that works wrongly. It is a system that sees the poor not as the enemy but as a force that has to be enslaved and any opposition has to be dealt with violence. And enslaved is the right word. They want the people obedient without any objections to a system that wants them to serve, consume and not speak. And they do that provocatively. In a lot of American and western cities including European cities, helping the homeless is a penalized crime. Iron bars and street nails have arisen in places homeless found settler. Education and health coverage has become unfordable for the poor and protection at the work a tale from the past. Minimum wage can be a plate of food. And this is not in a third world country, it is our western civilization, champion of equality and rights. The banks legislate the laws and the cooperatives apply them. For the communication and the enforcement they use governments and institutions including religious institutions. One of the first airplanes to reach Nepal after the lethal earthquake was from an evangelist organization based in USA. While people are dying from lack of everything and the State of Nepal is literally in panic, how the good Christians helped? By sending hundreds of bibles. This is just a sign on how the establishment sees humanity. As the field they can explore and profit even from their disasters and death. The people of Baltimore behave exactly the same way the people of acted in London a few years ago, in Paris or in Athens and I’m afraid they will act more often like that in the future. It’s not only living in a world that forcefully discriminates the poor but it does so with inhuman violence using the elements which mission is to protect them as executioners. And if it is the African American community the main target for the American police, it is the Arab and Muslim community in Europe, it is the immigrants in nearly every country. And what all these people have in common? Poverty. Actually and I have used exactly the same phrase many times before, while trying to enforce a global economy they succeeded to establish a global poverty and now they don’t like it. And they think that using provocatively the state power and the violence that they will be able to control. While the situation in Baltimore and Ferguson before looks bad the real evil has hit Europe, the governments and the EU bureaucracy openly supports the banks and the rich undermining the poor and the needed. While countries like Spain, Portugal and Greece live national poverty with unemployment over 20%, countries like Poland, Hungary, Bulgaria or Estonia there are nothing more than an economic bubble that is a matter of time when they are going to explode. And this is only the western countries because south and east things are even worst. In the country where even the doors are made from gold, Saudi Arabia there is a vast part of the population living in the streets and other countries like Nigeria (another oil producer) or Libya people are dying from starvation and thirst. On top of that organizations under the veil of religion continue murdering, dealing drugs and human trafficking. Most of the revolutions that changed the world from Spartacus to the French or the Russian revolution started from people who had nothing to lose. And on their way they destroyed everything. The poor nowadays have nothing to lose. 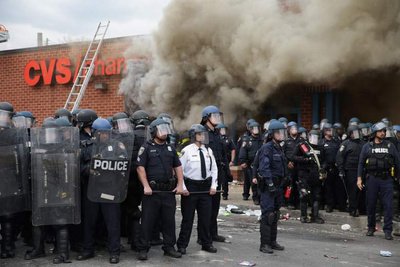 A few days ago, at a press conference with the PM of Japan, President Obama referred to what is transpiring in Baltimore as “a slow burn that has been going on for a long time.” He must have been thinking of the riots in Baltimore in April 1968 almost fifty years ago following the assassination of Martin Luther King. But of course, as also hinted in the above article by Thanos, the slow burn is much longer than that and has to do with class inequality and bad distribution of income coupled with a non-existent distributive justice. It all amounts to basic injustice which provokes resentment and frustration. Indeed, it is a global problem and it has been simmering since the establishment of capitalism by those who find it profitable to exploit the misery of the poor and disadvantaged in order to enrich themselves. Believe it or not, it goes back to the Italian city states of the 14 century, to the Medici bankers, before the discovery of America; it is so old that many many by now consider it “normal.” The present Pope has been reminding us that it is not normal under any circumstance, and of course he has been promptly been declared a communist or at least a pinko by "right-thinking" people. But the aspiration for social justice is even older than capitalism. It goes back to Plato’s Republic and More’s Utopia and it was practiced by the early Christians who “cared for each other and held everything in common.” Whenever I hear the biting sarcastic question: “do you love the poor or are you just jealous of the rich?” a question which reveals much of those who ask it, I respond that the answer to that probing and unfair question lies in a visit to a Franciscan monastery where one can observe that there they also hold everything in common and do not consider poverty a disease of sort, and love the poor, and they manage to do that without necessarily subscribing to a political party called the Communist Party. Yes ! Yes ! To both of you brilliant gentlemen. A very worthy, accurate and poignant Conversation to be had the World around !